Cheesy Macaroni and Beef Casserole with ground beef, crushed tomatoes, lots of sharp cheddar cheese and topped with crunchy bread crumbs! It’s the perfect quick weeknight meal that everyone including the kids will enjoy! 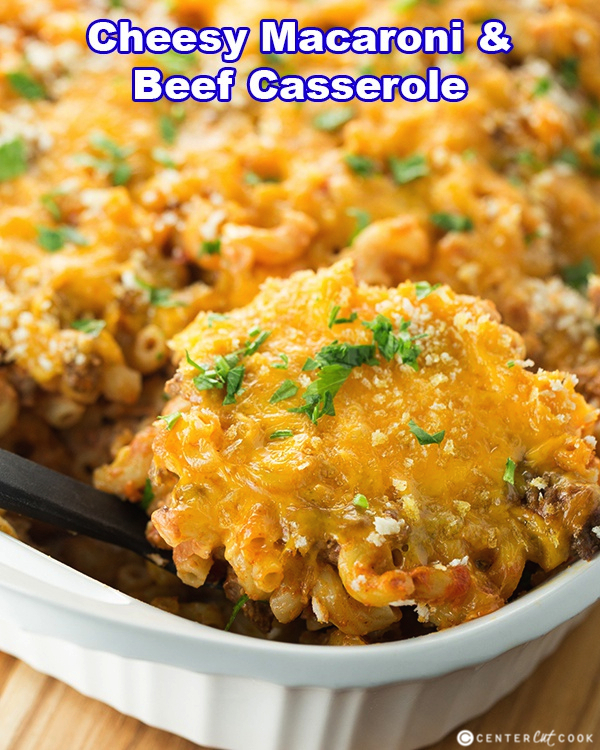 I am always looking for quick and easy casserole recipes that I can make with ground beef; casseroles that come together quickly for hectic weeknights. 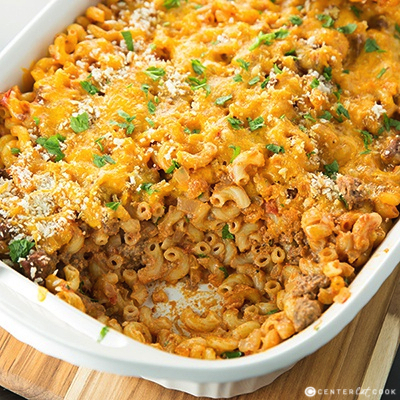 When I threw together this Cheesy Macaroni and Beef Casserole, I was simply trying to use up ingredients I already had in my fridge and pantry – ground beef, cheese, some whole beat elbow macaroni, and a can of crushed tomatoes. The final product? 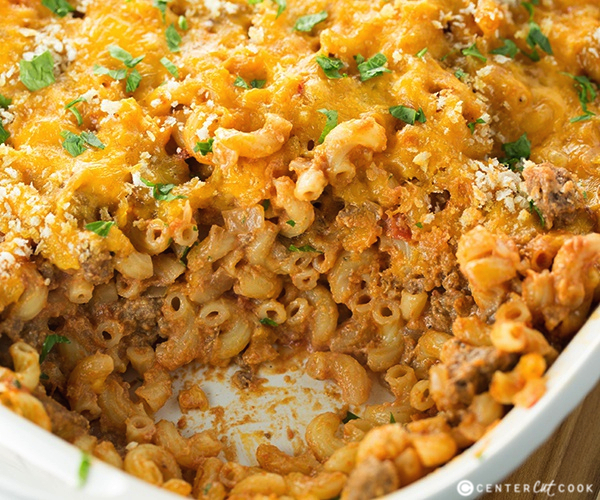 A cheesy, beefy casserole with a crunchy topping that heats up perfectly the next day for leftovers! Do you cook with ground beef very often? I like to switch things up and sometimes in place of lean ground beef I’ll sub in ground turkey or even ground chicken. You can use either of those meats in this recipe so use whatever you have on hand. To add a little depth to an otherwise pretty simple casserole, I added in some crushed tomatoes and seasoned it all up with some onion, garlic, chili powder and paprika. Along with the cheese, I stirred in some sour cream for a hint of creaminess. Oh, and did I mention the crunchy topping yet? I sprinkled some panko bread crumbs on top to add a little crunch and it was just perfect! Panko bread crumbs can be found in the same aisle as the regular bread crumbs. They are considered Japanese-style and they work perfectly for this recipe. 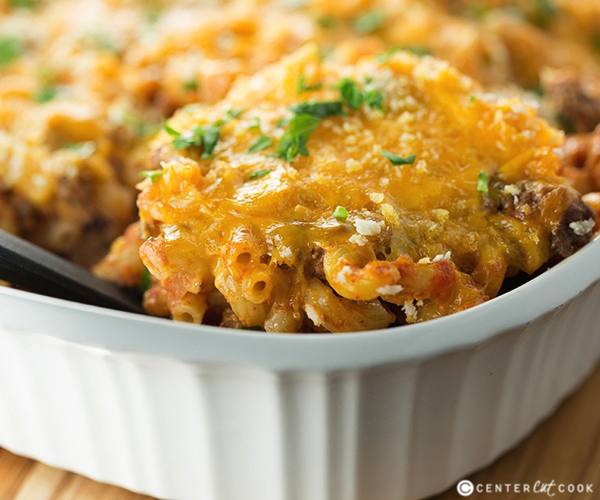 This Cheesy Macaroni and Beef Casserole is great for kids and for those hectic weeknights. Leftovers heat up well. While it’s a simple casserole and one that I wouldn’t necessarily entertain with if I was really trying to impress, we love this for something simple and easy. It’s a great way to use up any leftover ground beef or ground turkey. Enjoy!